It’s been a tough few months for Hyde FC. A fortnight after winning promotion to the Blue Square Conference Premier for the first time in the Greater Manchester club’s history boss, Gary Lowe, and assistant, Martyn Booty, quit the side, citing a lack of funds and only a short-term contract offer as the driving force behind their decision. Fast-forward to the beginning of the current campaign and, after 11 games in the top-tier of non-league football, Hyde are rooted to the bottom of the Conference table on 6 points; 5 points from safety with a game-in-hand. To compound matters, PC Nicola Hughes and PC Fiona Bone were murdered not far from the club’s Ewen Fields home a couple of weeks ago; for a club defined by its local community this was a devastating blow for the area. To say life in the Blue Square Premier has been a baptism of fire would be an understatement, yet, there is much for The Tigers to be optimistic about and remembering that their current level of football is the highest in the club’s history would serve all connected with the club well over the rest of a historic 2012/13 season. Originally formed in 1885, Hyde FC have the dubious ‘honour’ of holding the record for the heaviest competitive defeat in English football when an early incarnation succumbed to Preston North End in the FA Cup in 1887 by the princely score of 26 goals to nil. After folding in 1917, the club resurfaced in 1919 as Hyde United and only reverted back to Hyde FC in 2010. A lack of funds prevented Hyde United stepping out of the Cheshire County League for a vast chunk of the 20th century despite being founder members of the Northern Premier League in 1968. The Tigers then remained in the Northern Premier Leagues from 1982 until 2005, when the club embarked upon Conference North football. If the club expected the better quality of football in the Conference North to promote stronger management within Hyde United then they were to be sorely mistaken. After a few seasons of achieving mid-table finishes the club ended 20th in 2008/09 which usually would have seen their relegation back to the Northern Premier League. As is often the case in the non-leagues, though, another team (King’s Lynn) were demoted instead for not meeting Conference North ground standards. The reprieve didn’t sustain the happy mood at Ewen Fields for long as, only a few months later, on 24th September 2009 the club was officially wound up at the High Court in London due to debts totalling £120, 000 being owed to HM Revenue and Customs. Amazingly, club officials, supporters and players pulled together to raise enough money to overturn the decision and on 30th September 2009 Hyde United were a football club once more. One such way those behind the resurrection of the football club raised some life-saving funds was by holding a bucket collection outside the City of Manchester Stadium before a Premier League match involving the cash-rich Manchester City, and the last couple of years have seen ties between Hyde and their Abu Dhabi-owned neighbours intensify. 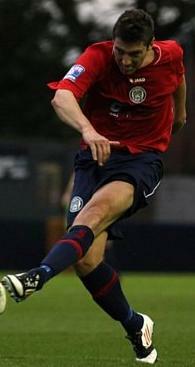 In 2010, the colour of the ground was changed from red to blue and the colour of the kit was changed to a white shirt and navy shorts from the traditional red shirt and blue shorts due to funding enabled by Manchester City FC. Hyde reverted back to wearing red after a season in unfamiliar colours, though, the ground remains blue and is emblazoned with strong ManCity marketing tools. City’s club crest adorns the entrance to Ewen Fields and, but for the expected Blue Square Premier logos around the ground, all the advertising hoardings pledge allegiance to the current Premier League champions; the Manchester City website, Etihad Airways and Abu Dhabi all represented. 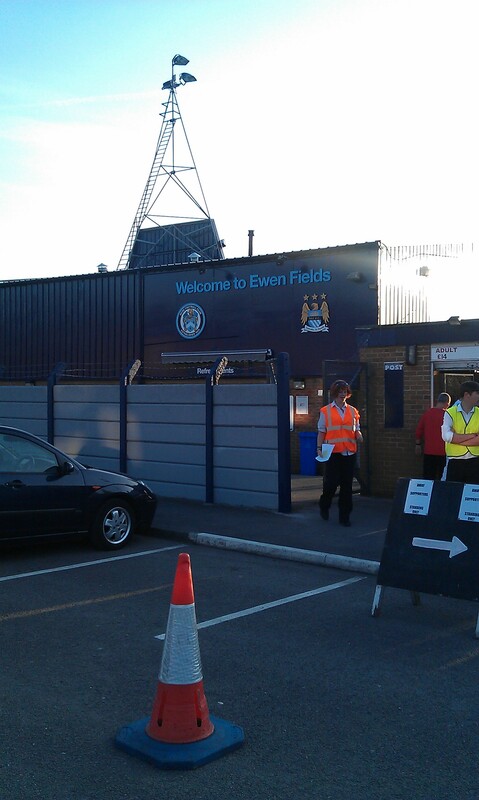 The entrance to Ewen Fields lets you know that certain rich businessmen have been here before. The 2012/13 season is the fourth season running that Hyde’s shirts have been sponsored by City in the Community – Manchester City’s local scheme to get youngsters in deprived areas playing football. Manchester City’s reserve team also play at Ewen Fields and the two clubs’ efforts to attract City’s followers to watch Hyde in action and adopt them as their second club can’t be a bad thing for The Tigers. At worst, the relationship with Manchester City dilutes Hyde’s own proud identity and, among knowledgeable non-league enthusiasts, the developments over the past couple of years have been met with cynicism. Indeed, in The False Nine’s first watching brief, Barrow fans chanted “You sold your history” during an entertaining 0-0 at Ewen Fields earlier in the season (of which, more later) and there are many who believe Hyde’s ascension to a national division for the first time in their history was heavily influenced by benevolent donations from the Manchester City management. The criticism is analogous to someone being jealous of their friend’s relationship with a millionaire. The link with City surely will have helped the Hyde cause but, there’s not much to suggest that The Tigers’ path was drastically altered owing to an injection of cash prior to the successful campaign in 2011/12. Having flirted with relegation in 2010/11, Hyde appointed Lowe and Booty to turn their fortunes around ahead of the following season in the Conference North, and their organisational skills, plus the 32 goals of new recruit, and ex-Everton ‘wonderkid’, Scott Spencer, led to an unprecedented title success for the shocked and delighted Tigers. Murmurs abounded following the resignations of Lowe and Booty. The general consensus was that the duo left, believing that another club would appoint them (which, if true, didn’t materialise) and some Hyde supporters felt that they went because they thought they were better than the club. The given reasons (lack of funds) contrast the view that Hyde receive substantial financial backing from Manchester City and a modest summer’s recruitment enhances the non-cynical view of the Ewen Fields club as a testament to hard work and good management throughout the set-up. The club quickly moved to appoint ex-caretaker manager of The Tigers, Scott McNiven, as manager and the well-travelled ex-Everton, Sunderland, Aston Villa and Bolton Wanderers midfielder, Gavin McCann, as assistant. Both 34, the task of keeping Hyde up in the league is a daunting one but, if they can start to impress at Ewen Fields then the hope is that they will manage at the club for years to come. Back in August (the 14th, to be precise), The False Nine took in Hyde’s first ever home game in the Conference Premier and saw a decent side shade a goalless contest versus Barrow in the glorious sunshine. The Tigers (who enter the pitch to Guns ‘n’ Roses’ ‘Welcome to the Jungle’) began their landmark season with a creditable 2-2 draw away at Braintree Town and a second point gained at Ewen Fields suggested that they would be competitive at this level. Subsequent matches have plunged Hyde to the bottom of the standings. One win, three draws and seven defeats places the club in the endangered species pot but, they have had a tough start in the division, predictably losing to title-hopefuls in Luton Town, Mansfield Town, Forest Green Rovers and Wrexham. Losses away at Lincoln City and Dartford could be forgiven, though, the home reverse to Southport represented a missed opportunity for The Tigers. Their sole victory, a 5-2 thumping of League Two dropouts, Hereford United, showed what they are capable of and getting the front three of Stefan Cox, Phil Jevons and the aforementioned England C international Spencer, who all impressed against Barrow, to work effectively together is vital if Hyde are to secure an improbable stay of execution in the Conference Premier. Shoring up the defence, helped by the loan acquisition of Ben Dennis from Bolton Wanderers, is a matter of urgency for The Tigers too, having shipped 21 goals from their 11 games – the 0-0 against Barrow the one clean sheet so far. The potential to blend in with the Conference Premier crowd was in evidence versus Barrow when a lick of paint prevented Jevons earning Hyde all 3 points. The non-league’s top tier is an unforgiving league which will require Hyde to reach their full potential every week to maintain their status in the division. Coast at all and they will be lost to national competition forever but, there is enough in their ranks to turn their season around given a sustained and wholehearted push in the right direction. Hyde play at home to Gateshead on Saturday which is the kind of fixture which must be won to give The Tigers a fighting chance of survival. Traditional derbies versus Stalybridge Celtic and Droylsden have been swapped for prestigious Lancashire fixtures against Macclesfield Town and Stockport County, but for how long? If football can unite a local community after tragedy then it is hoped that the two recently departed angels of the north can bestow 3 points upon the followers of Hyde against Gateshead and maybe inspire more unprecedented success in this little corner of Greater Manchester. This entry was posted in Reports and tagged conference premier, gavin mccann, greater manchester, hyde fc, man city, non-league, phil jevons, scott mcniven, scott spencer by Andrew Belt. Bookmark the permalink.